Here's Why Israel's New Defense Minister Is So Controversial : Parallels Prime Minister Benjamin Netanyahu has named hard-liner Avigdor Lieberman his new defense minister, a move that has ignited a fierce debate inside Israel and beyond. 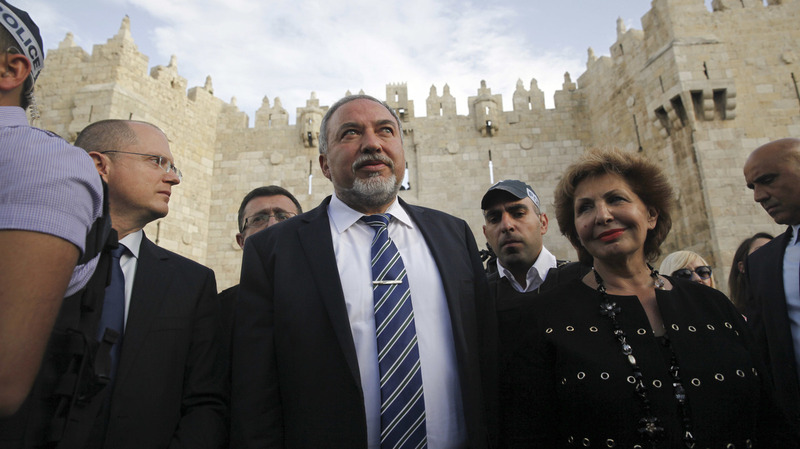 Avigdor Lieberman, who became Israel's new defense minister this week, visits Jerusalem's Old City on March 9. Lieberman's hard-line positions and controversial remarks have ignited fierce debate in Israel and beyond. After a week of intense negotiations, Israeli Prime Minister Benjamin Netanyahu signed a deal Wednesday to bring the right-wing nationalist party, Israel Our Home, into an expanded coalition government. Under the agreement, party leader Avigdor Lieberman — a polarizing figure inside and outside Israel — will become defense minister, arguably the second most important job in the country after Netanyahu's own position. Israel's Maariv newspaper, right-wing itself, dubbed this Israel's "most right-wing and extremist" government in the country's 68-year history. While this designation is open to debate, Lieberman's appointment comes as growing nationalist policies are inflaming divisions within Israel and with the Palestinians. Lieberman, a secular, nationalist politician, grew up in the former Soviet Union and immigrated to Israel when he was 20. He became involved in politics early on, joining the rightist Likud before forming his own party, Israel Our Home (Yisrael Beyteynu), in 1999. The 59-year-old has long been known for extremist rhetoric, such as suggesting during the 2015 election campaign that Israeli Arabs who are not clearly loyal to the state should be beheaded. He has served in many government positions, including twice as foreign minister under Netanyahu. The two have had a fractious relationship but ran together on one ticket in the 2013 elections. Lieberman's core political base is the roughly 1 million Israelis who immigrated from the former Soviet Union, many coming in the 1990s. He demanded the defense minister's job as a condition for joining Netanyahu's coalition. Lieberman also negotiated additional money for poverty-stricken retirees. Why does Netanyahu want Lieberman's party in his government? The coalition government Netanyahu brought together after Israel's March 2015 election gave him the narrowest of majorities, 61 to 59, in the Knesset, Israel's parliament, which has 120 seats. Lieberman's party ups the government's majority to 65 votes in the Knesset. In Israel, much legislation is hammered out in the Cabinet — made up of coalition members — and members of the Knesset from those coalition parties are expected to endorse those decisions with their votes. Still, such a slim majority left Netanyahu with little room to maneuver. A single member of his coalition could potentially block legislation. A U.S. State Department spokesman said Wednesday that Lieberman's appointment raised "legitimate questions" about the direction of Israeli policy. What questions? The Obama administration's main policy concern is keeping alive the possibility of a two-state solution between Israelis and Palestinians. Israeli settlements and industry continue to expand in the West Bank, land Palestinians claim as part of a future state. Palestinians, along with many others, say this is making it increasingly difficult to negotiate a viable Palestinian state. In addition, Lieberman's appointment comes after a year in which hard-line nationalist policies have gained increased prominence in Israel. The current minister of culture, Miri Regev, has proposed stopping public funding to cultural groups deemed disloyal to Israel. Israeli human rights organizations that receive funding from governments abroad have come under new scrutiny. Some of these groups have been called traitors by Lieberman. Israel's deputy chief of staff, Yair Golan, warned in a speech earlier this month that he saw trends in Israel similar to those in pre-Nazi Germany. The now-fired defense minister, Moshe Ya'alon, responded to this controversial remark by urging military officers to continue to speak their minds. Recent government policies, and Lieberman's history of provocative remarks, have some Israelis warning that the country is becoming more isolated and losing support internationally. But Lieberman's supporters view him as a politician who says out loud what other people think but will not say. Is it possible that a right-wing government could make progress on peace negotiations with the Palestinians? Responding to criticism of Lieberman and his party, Netanyahu's office said that hard-line politicians have gotten further with Palestinians because Israelis feel confident security concerns will be front and center of any negotiations. And unlike other right-wing parties in the current government, Lieberman has proposed a peace deal that includes giving land to the Palestinians. His proposal would draw a border so that most West Bank Jewish settlements would be placed inside Israel, and towns currently in Israel with high Israeli Arab populations would wind up on the Palestinian side. However, Israeli Arabs have expressed strong opposition to this plan, with many saying this would effectively strip them of their Israeli citizenship.